The animal world is full of charlatans. Some have bodies shaped by natural selection to fade into the background or resemble other harmful species. Yet others, like chameleons and octopuses, have the rare ability to actively change their colour or shape to actively hide themselves from view. Many species disguise themselves through their behaviour rather than their bodies; like human soldiers in camouflage gear, they don special suits to remain inconspicuous. Decorator crabs, for example, coat their shells with a collection of sea anemones, algae, corals and sponges, held on with Velcro-like bristles while other crabs actively carry these living masks with specially modified legs. These species have the cartoonish air of a man carrying a pot plant in front of him while sneaking past on tip-toes. But some charlatans are not so amusing. Robert Jackson and Simon Pollard from the University of Canterbury have been studying a pretender with a much more gruesome disguise – the ant-snatching assassin bug Acanthaspis petax, which covers itself with the corpses of its own prey. The best communicators know to cater to their audiences, and cuttlefish are no different. A new study shows that these intelligent invertebrates can target their defensive signals to the hunting styles of different predators. Cuttlefish and their relatives, the octopuses and squid, are expert communicators whose incredible skins can produce a massive range of colours and patterns. Cuttlefish mostly use these abilities to blend into the background but they can also startle and intimidate predators by rapidly changing the display on their dynamic skins. Keri Langridge and colleagues from the University of Sussex, watched young cuttlefish as they were threatened by three very different predators – juvenile seabass, dogfish (a type of shark) and crabs. A glass partition protected the cuttlefish from any actual harm but gave them full view of the incoming threats. She found that the cuttlefish only ever used startling visual displays when they were faced by seabass, which hunt by sight. As the fish approached, the young cuttlefish suddenly flattened their bodies to make themselves look bigger and flashed two dark eye-spots on their backs to startle the predator. This pattern is called a ‘deimatic display’ and it was used in 92% of encounters with seabass. The sabre-toothed cat is one of the most famous prehistoric animals and there is no question that it was a formidable predator, capable of bringing down large prey like giant bison, horses, and possibly even mammoths. The two massive canines – the largest teeth of any mammal – are a powerful visual. But while they were clearly powerful weapons, scientists have debated their use for over 150 years. 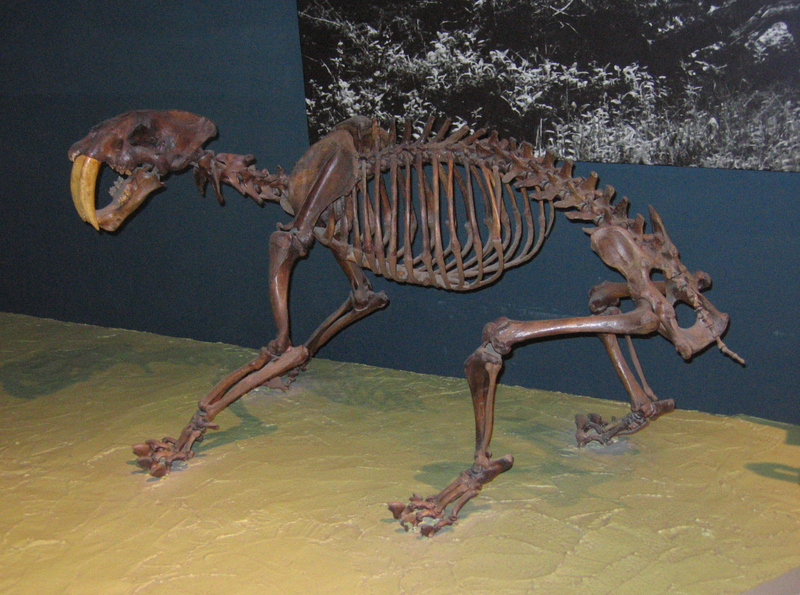 Now, a new study shows that Smilodon, the most iconic of the sabre-tooths, had a surprisingly weak bite. They were a precision weapon that were used to deliver a single, final wound to an already subdued victim – the equivalent of an assasin’s stiletto rather than a swordsman’s blade. Earlier suggestions pictured Smilodon using its teeth to hang onto the back of large prey, to slash their abdomens open, or to impale them at the end of a flying pouce. One of the most popular theories said that the cat would have used its teeth to sever arteries and airways with a decisive bite to the throat – a quicker technique than the suffocating neck bites used by modern lions. Working out how strongly Smilodon could bite would go a long way towards deciding on one of these theories and to do that, palaeontologists have studied the animal’s fossilised skull. Even then, opinions have gone either way depending on which bit of the skull they looked at. The muscle attachment points suggest it has small jaw muscles, but the bite could have been powered from the neck. The lower jaw is smaller, but strongly built, lending weight to the idea of a powerful bite. To get some clearer answes, Colin McHenry and colleagues from the University of Newcastle, Australia decided to put Smilodon‘s skull through a digital crash-test. They used a technique called ‘finite element analysis‘ or FEA, which is typically used in mechanical engineering and crash-testing for cars. When Oriental hornets attack, Cyprian honeybees mob them in a huge ball that targets the breathing apparatus in the hornet’s abdomen. The hornets can’t breathe without expanding their abdomens and with sheer numbers, the bees strangle the hornets to death. Hornets are giant wasps that pack a powerful sting. To most people, they can be a painful nuisance, but to honeybees, they’re killing machines. Hornets greatly outsize and overpower honeybees and a few individuals can decimate entire colonies. Asian honeybees have developed a remarkable defence called ‘heat-balling’ against their local hornet, Vespa velutina. A giant ball of bees piles onto the predator, weighing it down while vibrating their wing muscles. The frenetic activity greatly increases the temperature inside the ball to about 45C – hot enough to cook the hornet alive, but five degrees under the bees’ maximum tolerated temperature. Cyprian honeybees face a different predator, the Oriental hornet Vespa orientalis and unlike its wimpier cousin V.velutina, this species can take the heat. The Oriental hornet lives in hot, dry climates ranging from Central Asia to the Mediterrenean and it tolerates temperatures just as high as honeybees. Heat-balling shouldn’t work on them. And yet, Cyprian bees still encase Oriental hornets in large balls. Surprisingly, the strategy works – despite their heat tolerance, the hornets still die. The bees’ stings are useless against the hornet’s tough cuticle and they barely use them. What could they be doing instead? In the Alien movies, the eponymous monster killed shipmates and marines with a fearsome set of double jaws. That may have been science fiction but science fact isn’t too far off. In our planet’s tropical oceans, moray eels use a ballistic set of second jaws to catch their prey. You are being hunted, chased through a labyrinth by a relentless predator. Do you consider your options and plan the best possible escape, or do you switch off and rely solely on instinct? A new study provides the answer – you do both, flicking from one to the other depending on how far away the threat is. Earlier studies have found that different parts of a rodent’s brain are activated in the face of danger, depending on how imminent that danger is. Now, a study by scientists at University College London has found the same thing in human brains. It would be a poor strategy to stick to the same defensive behaviours in all situations. Simply put, there are threats and there are threats, and we need different kinds of behaviour to cope with different scales of danger. When a predator is fifty feet away, we have the time and space to consider our options and plan an escape. But when it’s five feet away, such luxuries are ill-afforded and behaviour needs to be fast and reflexive. In the millisecond between life and death, free will takes a back seat in the light of three simple options – fight, flight or freeze. This sounds fairly obvious, but Dean Mobbs and colleagues actually watched the switch taking place by scanning the brains of several volunteers as they were being chased by a predator. Rattlesnakes can track their prey using the infrared light given off by the warm bodies. But ground squirrels can use this super sense against the snakes. By pumping blood into their tails, they give off infrared signals that fool the snakes’ heat-seekers. It seems like an uneven match. In one corner, the unassuming California ground squirrel (Spermophilus beechyi), 30cm in length. In the other, the northern Pacific rattlesnake (Crotalus oreganos), more than twice the length of the squirrel, and armed with hinged fangs that pack a lethal venom. But thanks to a cunning adaptation, the squirrel often gets an unexpected upper hand in this bout. Ground squirrels live in a series of burrows that keep them out of reach of most predators. Snakes, however, have exactly the right body plan for infiltrating long sinuous tunnels, and it’s not surprising that they are the squirrels’ major predators. It’s equally unsurprising that the squirrels have developed ways of defending themselves against snakes.